Hi, finally Google launched Android 7.1.1 Nougat stock Rom for Google Nexus 5X. This is a stock rom based Android 7.1.1 Nougat and here is an easy and safe tutorial for install Google Nexus 5X Nougat 7.1.1 Stock rom. Google Nexus 5X has Brilliant 5.2 inch Super AMOLED screen with 1080 x 1920 pixels resolution. This phone comes with superb build quality and innovative design. Google Nexus 5X has two outstanding features Qualcomm Snapdragon 808 and Corning Gorilla Glass 3 with oleophobic coating, it’s make this phone very smoother and faster. This is a Google Nexus 5X Nougat 7.1.1 Stock rom and it is base on Android 7.1.1 Nougat ROm. Release Month Date: Jan 2017. 1. First you should take a Full backup of your phone. 4. Unlock bootloader Google Nexus 5X. 5. Read all steps then do it careful. Step 1: Download and Extract Android 7.1.1 Nougat Stock ROM and fast-boot flashing package of Google Nexus 5X in a folder, where you want. And Download and Extract Google Nexus 5X Usb driver and install It. Step 2: Now open Stock ROM and fast-boot flashing package folder of Google Nexus 5X and click on “flash-all.bat” to run it. 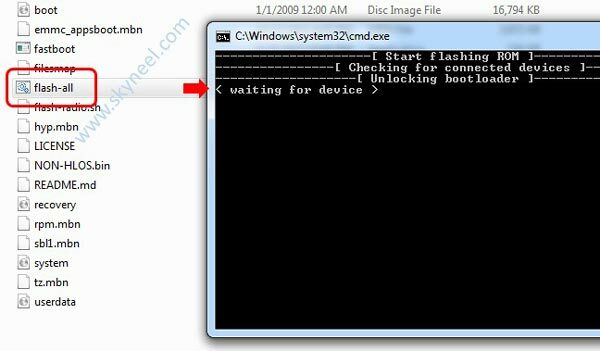 Now you can see command window, in this command window you will see a message “< waiting for device >”. Step 3: Now connect your Google Nexus 5X in fast-boot mode (Press and hold Volume Up key) with USB cable to your PC or Laptop. The Flashing procedure will start and Don’t disconnect the Google Nexus 5X during flashing procedure. After finished this process, The command windows is automatically closed. Step 4: Disconnect your device and Now boot your device by long pressing (approximately 3-5 minutes) the power button. After install Google Nexus 5X Nougat 7.1.1 Stock rom, you can root your phone because root allows you to use a maximum of your phone without any restrictions. After root you will install custom apps, Rom and custom setting in your phone. But first read Root Advantage and Disadvantage by this article then follow this guide to root Google Nexus 5X. I hope you like this New update Google Nexus 5X Nougat 7.1.1 Stock rom installation guide from which you will be able to easily install Google Nexus 5X Nougat 7.1.1 Stock rom without any extra efforts. If feel any problem in this guide then please use comment box. Thanks to all.